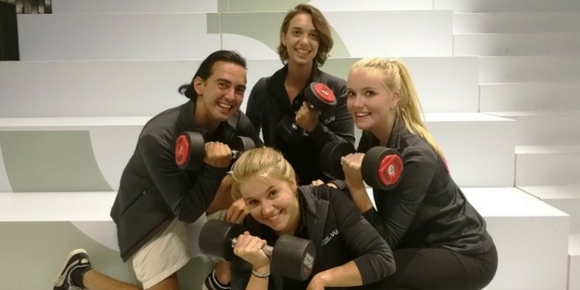 The SVU Promoteam consists of Arezoe, Ashwin, Imara and Lotte, coordinated by Marjolein Sno. Together with the team of VU Sports centre we promote the VU Sports centre on the VU amongst students. By organizing activities, being present at the VU bachelor days and introduction market, and organizing a party every now and then, we work on the visibility and awareness for the sports centre. Still there are students who don’t know what kind of possibilities the VU Sports centre offer, and it is our job to change that! Working out at the sports centre at Uilenstede is great fun and attending a sports class at the VU Campus is easy to do after a long day at the university. Ofcourse you can always stop us to talk about the VU Sports centre, tell us your ideas or remarks. Send us an email at promoteam@sportcentrumvu.nl or drop a message at the Facebook– or Instagram page. See you at the VU Sports centre!